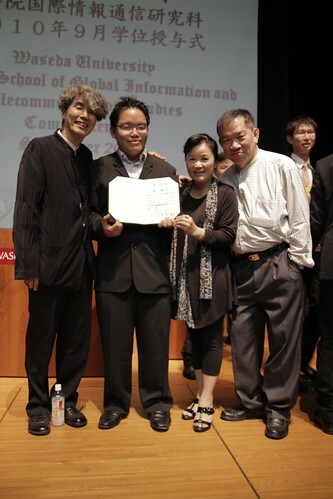 20th of September was my graduation day. My parents were here. We were walking to the ceremony with Professor Ando. 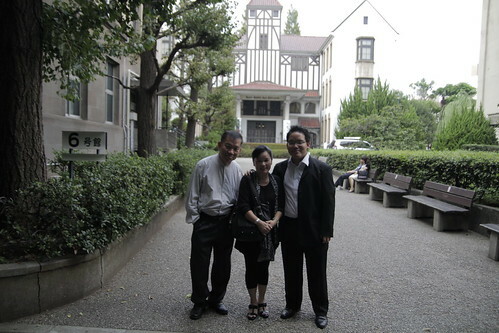 Behind us is the iconic Theater Museum in Waseda University. That's the statue of Okuma, founder of Waseda University. And the iconic Okuma hall. 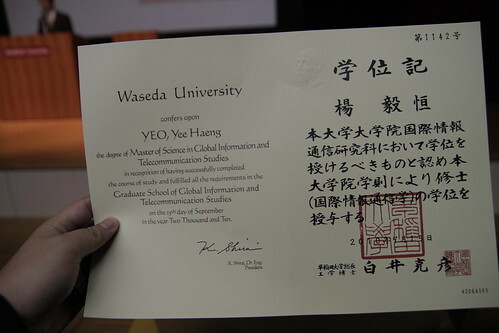 And so, in the brief ceremony, I finally received my Masters degree. NOW I can get a job as a film lecturer, yay! There were four of us graduating students from Prof. Ando's lab, my China friends Zifeng, Yang Yang and Koreihou (her name's actually Hu Lifang, but going by the Japanese pronunciation for her name, it's Koreihou, which is catchier). You may have seen them a couple of times in this blog. 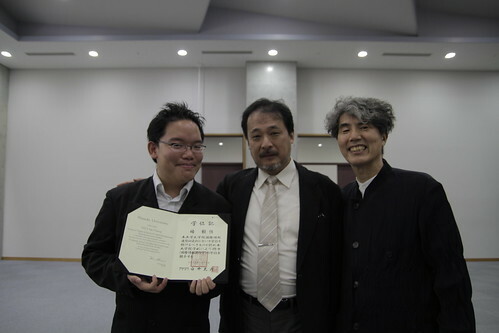 With Prof. Sakai, who is great buddies with Prof. Ando. 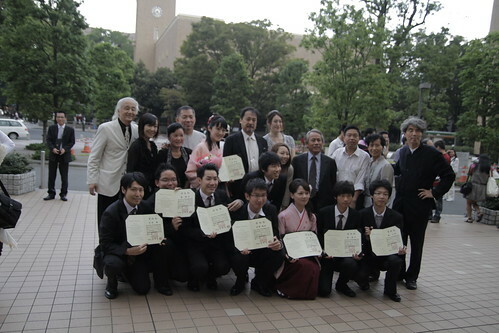 Group photo of graduation students from both Prof. Sakai and Prof. Ando's labs, along with students' parents. 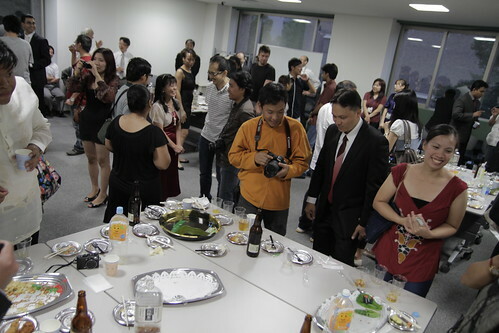 After that there was a reception, and Prof Ando raised a toast to us graduating students. 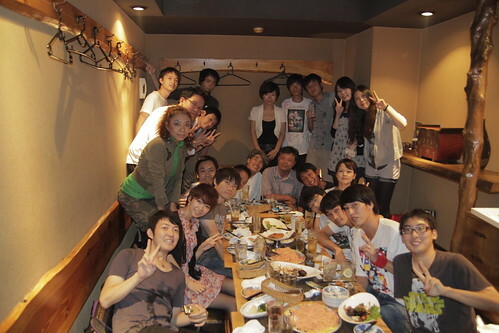 Later in the evening, when my parents left, I headed off to an izakaya at Takadanobaba for a dinner party organized for us by the rest of the Ando Lab folks. Another toast to our graduation... in which you will hear me sounding exceptionally monotonous. Nishina had prepared some gifts for us too. He was wearing that goldfish hat in honour of my film, KINGYO. 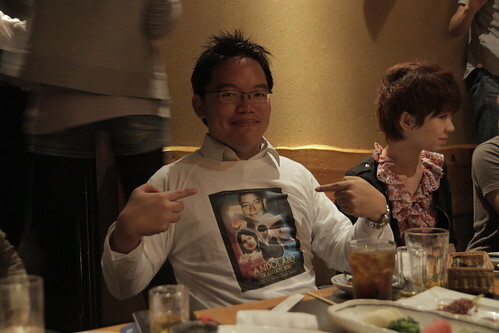 And here's my special T-shirt. The others were supposed to write messages on the shirt for us. 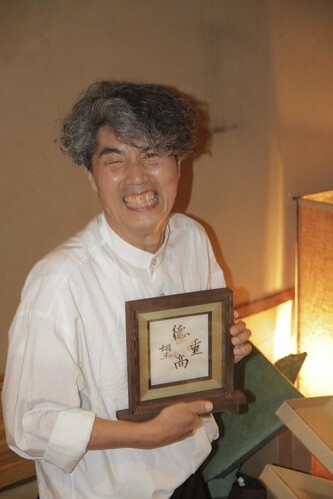 We had a gift for Prof Ando too, a wooden frame of calligraphy written by all four of us. Koreihou explains it here. The graduating students, Yang Yang, Zifeng and Koreihou gave speeches about how happy they were in the past two years, the invaluable lessons learnt, and how they will cherish these memories when they return to China. 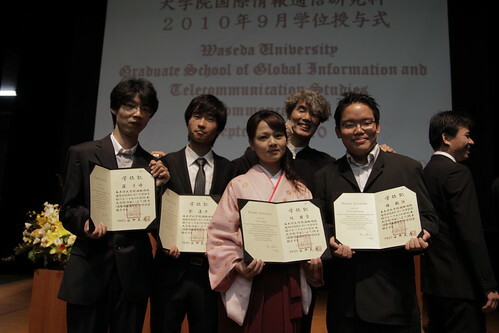 Both Prof. Ando and Motomura-sensei (asst prof) also gave speeches about the graduates as well. ... but since I'm still staying around in the lab, and the university. My speech was more like "well... it's been a fun 2 years, I'm still around, so I see you guys... tomorrow." While Prof. Ando and Motomura-sensei were like "since Edmund's still around, we'll just talk about the other three first." But nonetheless, it was a wonderful evening.